Leo Foster got his first major league at bat July 9, 1971, with his team, the Atlanta Braves, down 3-0 in the third inning to the fearsome Pittsburgh Pirates. He flied out to center. He batted again in the fifth with the score 5-0, but the Braves had gotten two men aboard with only one out. If they were going to make a game of it, this was their chance. Foster grounded into an inning-ending double play. His third major league at-bat came in the seventh with the game completely out of hand, the Pirates leading 11-2. Could some pride still be salvaged? Foster came to the plate with two men on base again, this time with no one out, and grounded into a triple play. Some years later, things evened out for Leo Foster in terms of memorable days. After never cracking the Mendoza line in three partial seasons with the Braves, he’d been traded to the Mets for Joe Nolan, and on September 7, 1976, in Wrigley Field, he singled twice and homered, driving in five runs, or 19% of his career RBI total, which, in terms of percentages and big days, would be like if Hank Aaron had a game where he erupted for 436 RBI. The Boston Red Sox saw value in Leo Foster, or else saw value in unloading Jim Burton on the Mets. Neither Burton nor Foster would appear in another major league game. I don’t know if Burton ever had the kind of day Leo Foster had in 1976 at Wrigley, but he definitely had a bad day, when he lost Game Seven of the 1975 World Series as a reliever. The following year, when my family was at Fenway for a game, a few players were giving autographs and my brother, unable to get through the throng to anyone else, got the autograph of a player he didn’t recognize who was standing all by himself. Maybe Leo Foster cried when he heard he’d been traded because he didn’t want to leave the Mets, with whom he’d experienced his one big day in the sun, or maybe he cried because trades are just inherently cruel, not just for requiring an uprooting of every aspect of your life but for the way they fix your worth so rigidly and graphically in terms of what you can fetch on the human meat market. And Leo Foster, who had once been traded for Joe Nolan, a decent-hitting young catcher destined to stick around in the majors for over a decade, now amounted exactly to a luckless pitcher young autograph seekers avoided. 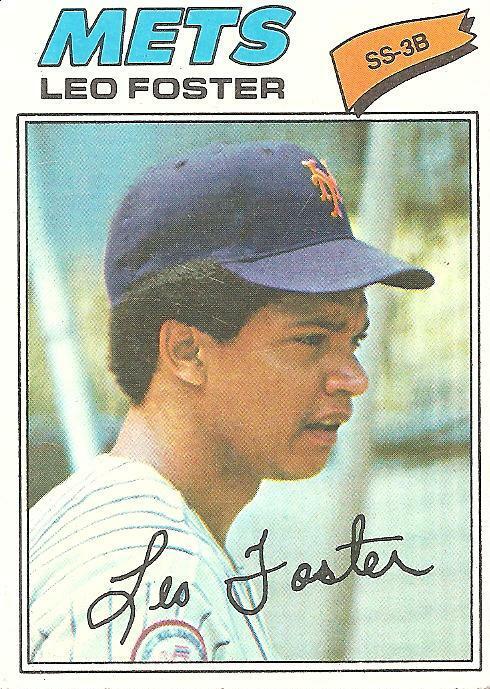 Leo Foster stuck it out for one season in the Red Sox minor league system in 1978, avoiding being part of the catastrophe on the parent club that season, then he called it a day, or maybe had it called a day for him. I don’t know what point I’m groping for in these notes on Leo Foster, but I guess I’m hoping Leo Foster was able to look back past the tears and the bad days to see that one big day when the ball kept rocketing off his bat and his teammates kept crossing the plate in front of him and he couldn’t be stopped and was, in those hours, the best baseball player in the world. He sorta looks like Moises Alou. Or, I guess I should say Moises Alou kinda looks like him. I believe the flip side of this card indicates Leo’s nickname was “Bananas” as in Bananas Foster. He’s one of those guys that I recall being on the Mets but not actually *playing for* the Mets. Those mid to late ’70’s Mets loved utility infielders with .224 batting averages. I had never heard of the name Leo before. Then in 1977, I learned of Leo Sayer and Leo Foster, and they both had the same hairstyle. Not sure if Leo Foster wore rainbow suspenders though. To this day, I’ll still link the two of them together. One of the things I love about this site is when I see a card I’ve never seen before. And 33 years late, I see Leo Foster. Sorry I’m late, Leo. I like the idea that, for one day, Leo was at the top of his game. I look at his card, and other cards, and think, “there was somebody on top of the world–young and playing in the big leagues and never going to be old.” I wonder what Leo Foster thinks when he looks at this card? Didn’t Jim Burton pitch a no-hitter for the PawSox in 1976? Perhaps that was his big day in the sun. sb1902: The ’78 Braves project is still ongoing; I decided to mix in other cards occasionally, since it’s taking me so long to get through the Braves. hudsongs: I hope you’re right about Burton in ’76. How many folks have into a double play and a triple play in the same game? THis guy did it in his debut. Impressive. Darrell Johnson was the one who caught flack for pinchhitting for Jim Willoughby and putting Burton on the mound. Burton go away relatively scot-free. i gotta think that foster is the first and only player in history to go one-two-three in his first game, making one out, then two outs, then three outs, in order, a feat perhaps never to be matched again.